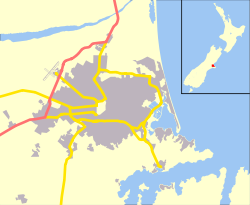 Westmorland is an outer suburb of Christchurch, New Zealand. It is situated mostly on a hillside and is a recent development of the city, dating back to the late 1970s. It is still under development, with the end of Pentonville Close being recently settled with modern family homes typical of middle to upper-middle class New Zealanders, predominantly in the usual bungalow style, called Worsley Estate. There is a road nearby called 'Worsleys Road'. However this is not connected to Worsley Estate at this time. Currently there is a lot of development happening at the top of the hill, going under the name of 'Westmorland Heights'. This is the final stage of the Westmorland development, and is expected to be completed in approx 2020, adding 250 homes to the suburb of Westmorland. This page was last edited on 4 April 2018, at 17:51 (UTC).